On reaching Ranebennur cross on the NH4 highway and realizing that Caudadanapura was situated close by, we were curious to see the temple of Muktheshwara that we had read about a while ago. We inquired about this place, but there seemed to be a lot of confusion with regards to the pronunciation of the name when finally, a jeep driver came to our rescue by correcting the same, from Caudadanapura to Chaudayyadanapura. On following his directions, we reached Chaudayyadanapura / Caudadanapura, a small village situated on the banks of the river Tungabhadra of Ranebennur Taluk, Haveri District. This place gets its name from the Veerashaiva Saint and Boatman, Sharana Ambigara Chaudaiah who lived here during the 12th Century. The place is also called by various names such as Shivapura, Muktikshetra and Gope. 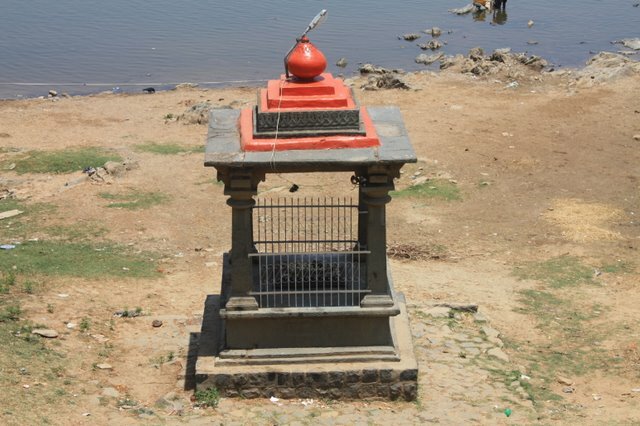 As per our readings, a mantapa on the bank of the river Tungabhadra housed the samadhi (Gadduge) of Sharana Ambigara Chaudaiah. But, we found only a small structure on the banks which we thought to be the samadhi, though not confirmed. 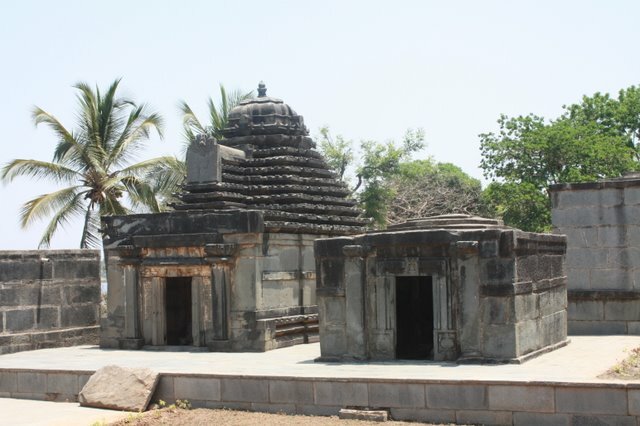 The temple of Mukteshwara in Chaudayyadanapura was built by the Chalukyas in the12th Century. According to a legend, this place is situated at place where river Tungabhadra changes its path or direction of flow indicating the beginning of a new course, symbolizing Mukti / Salvation (Redemption). 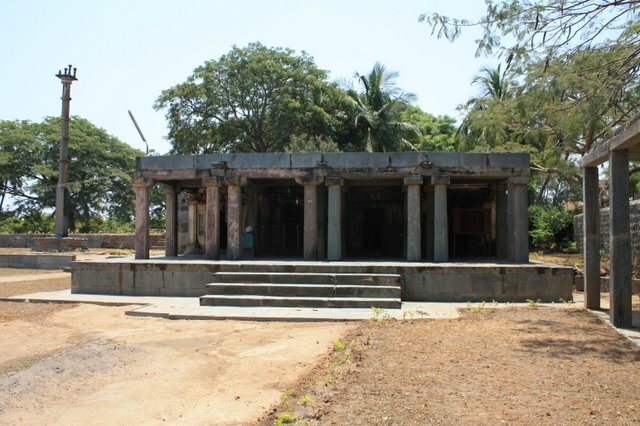 Hence, this place is called as Mukthikshetra and the deity worshiped here is Lord Mukteshwara or the God of Salvation. From our observations, it seems like our ancestors chose places close to water bodies and the summit of hills for the construction of the temples as these places were considered to be sacred. There are eight main inscriptions found in this place. As per the book referred below, one of the inscriptions states that, in the year 1191, an ascetic/saint by name Muktajiyar was at this place and performed rigorous rituals to please Lord Mukthinatha. Thus, the deity here came to be known as Muktesha. It further states that the name of Lord Mukteshwara was appropriate as he was bestowing Mukti on his disciples. 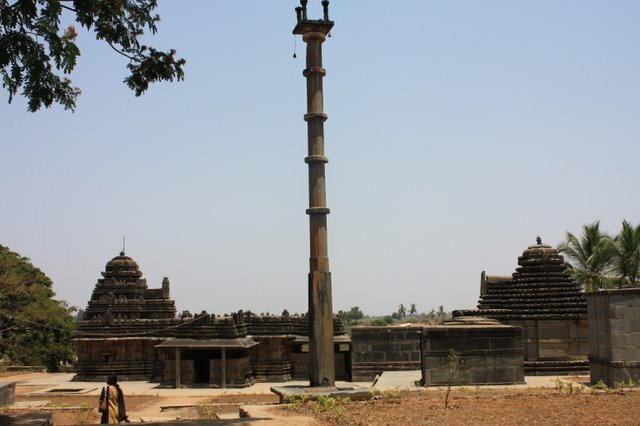 The temple complex consists of the main temple of Mukteshwara, the Kallideva temple, two small Shiva temples, another temple with four compartments of which two are dedicated to Lord Shiva, one for Lord Virabhadra and the other to goddess Chamundi. 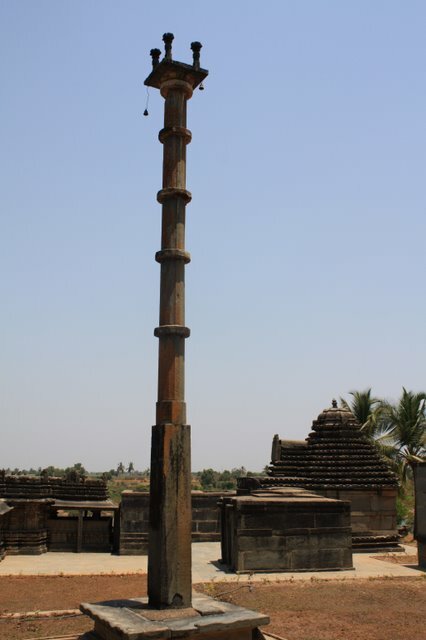 A Keerthistambha stands tall (about thirty feet) at the entrance of the complex. 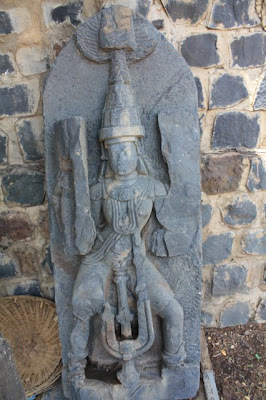 There is also a Gadduge of the saint Shivadeva inside the temple complex. The entire temple complex is well maintained. 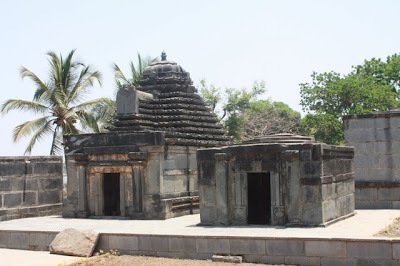 Reference: The Temple of Muktesvara at Caudadanapura: A Little-Known 12th-13th Century Temple in Dharwar District, Karnataka (Kalasamalocana) by Vasundhara Filliozat. Vasundhara Filliozat is a freelance historian and epigraphist. She has worked on many aspects of history of the Karnataka kings and the temple of Jakkanachari style in the Dharwar District. The above referred book contains a detailed study of the temple of Muktheswara and has been used for providing information in this post. Beautiful pics. the temple and surroundings are serene. Good info on the place and nice pictures! It is a very nice place. Chaudayyadanapura is known for various fruits that the villagers grow. That is indeed the 'gadduge' of Ambigara Chaudayya. During the annual festival of Mukteshwara large number of people belonging to the 'ambiga' cast assemble at Mukteshwara Temple. Looks like a separate post on Mukteshwara temple is on its way. Good photos. Another beautiful post Dhiraj, the temple looks grand and old. Lovely pics, gives a feel of the place. Your discoveries are really wonderful. Thank you for visiting Green Tomato. It is very intereting to see all of your photos. They are unfamiliar to my world! 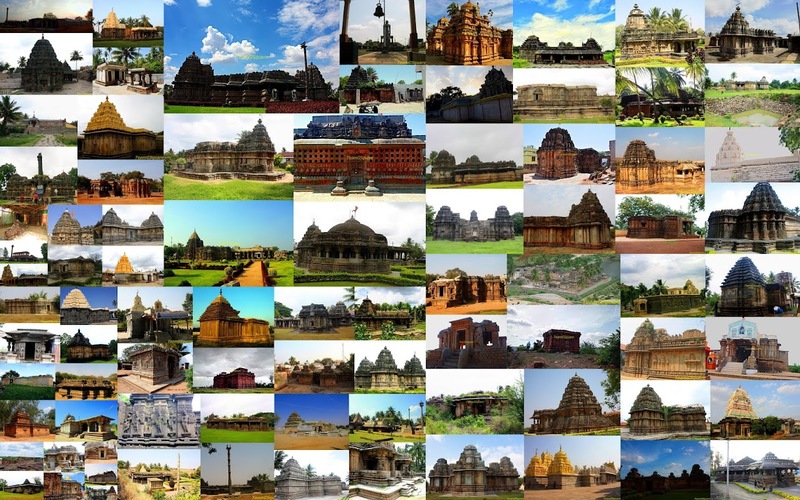 Superb pics of the little known 800 year old temple. The picture of the entire temple complex is magnificent. I do not find inner or outer praharas or courtyards around the temple. You are our historian, seriously :) another informative post - Bravo! keerthisthambhas are common in most indian temples, isnt it? or is it so only in karnataka?